Many of you followed along on my Instagram account this past week as I traveled around Ireland with my husband and our oldest son. It was our first time visiting and it was as enchanting as every movie makes it out to be! We ate at lots of pubs and restaurants and most of them served Irish brown soda bread, made with whole wheat, which they call simply, brown bread. 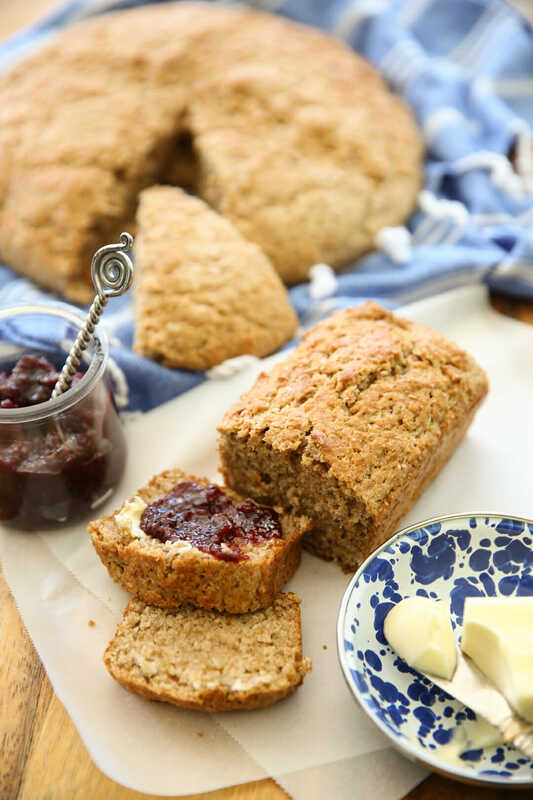 It brought me back to this recipe I shared several years ago for traditional brown bread, a recipe I got from an Irish friend of mine, Laura. Laura moved to my town in elementary school and her bright red hair and Irish accent completely wow’d me- and everyone else! I hadn’t made this recipe in years and whipped up a batch the day after we got home from our trip. It’s not like sandwich bread, it’s more of an almost biscuit-like texture; super soft and tender, and best on the first day it’s made. We love it along side a bowl of soup, stew, or salad. 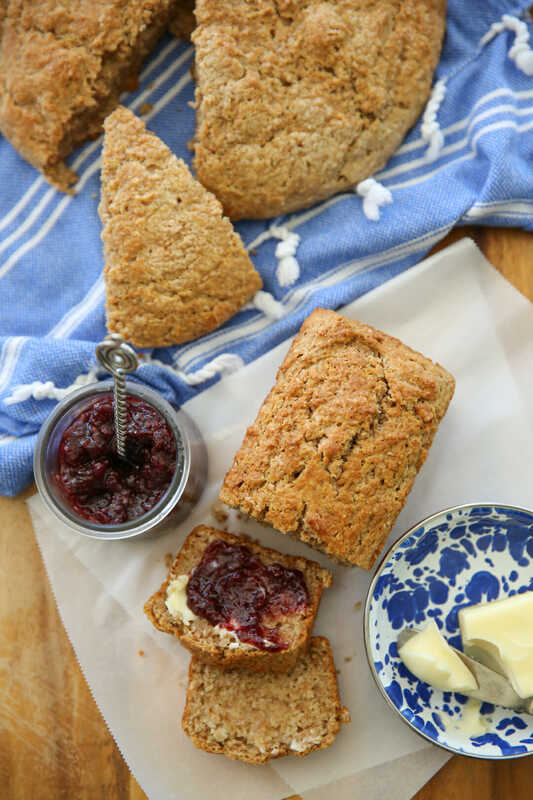 The best thing about brown soda bread is that it’s so quick and easy to make! No yeast involved, just stir and dump the ingredients and you have soft, tender bread in a matter of minutes. This bread utilizes a mix of whole wheat flour and white flour. Whisk it together with a little salt, sugar, and baking soda. This bread has both butter and oil it in. The butter is crumbled into this flour mixture. The easiest way to do this part is to take a cold stick of butter straight from the fridge and grate it with a cheese grater. 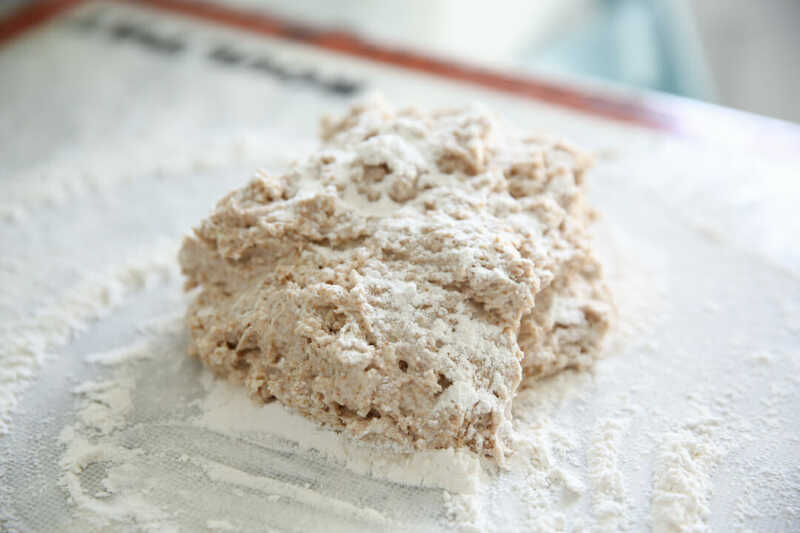 Then take your fingers and toss it in the flour, rubbing in between your finger tips to crumble it up. After the butter is cut in, just make a well in the middle of the mixture and pour in buttermilk and a little oil. that’s it. Stir it up so it’s all incorporated. It will be a wet dough- don’t think you’ve messed up and don’t expect the consistency of traditional bread dough! Now you can shape it two ways. When I originally posted this recipe, I dumped that really wet dough onto a generously floured surface and carefully formed it into a ball. 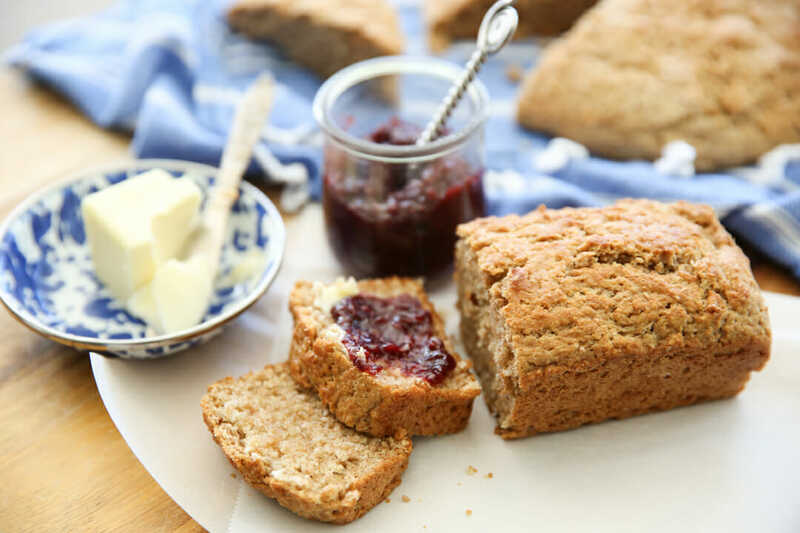 You can still totally do that, but I found while in Ireland, this bread was always cooked in a loaf pan so I tried it that way this time and it simplified things by eliminating the need for shaping and making an already quick bread really quick. Plus the wet dough seems to flatten out when left freeform and I liked the structure of the loaf pan- but either way works! We love this slathered in a little butter and jam, or with a bowl hearty bowl of stew or soup. This loaf was devoured by my kids as an after school snack- they finished off the whole batch! Stay tuned if you’d like to hear more about my trip to Ireland. I’ll share more photos soon over on my personal blog, SaraMichelleWells.com! A super quick and easy whole wheat bread that requires no yeast! Preheat oven to 400 degrees F. Line a baking sheet with parchment or spray a loaf pan with non-stick spray. *shaping options before starting! 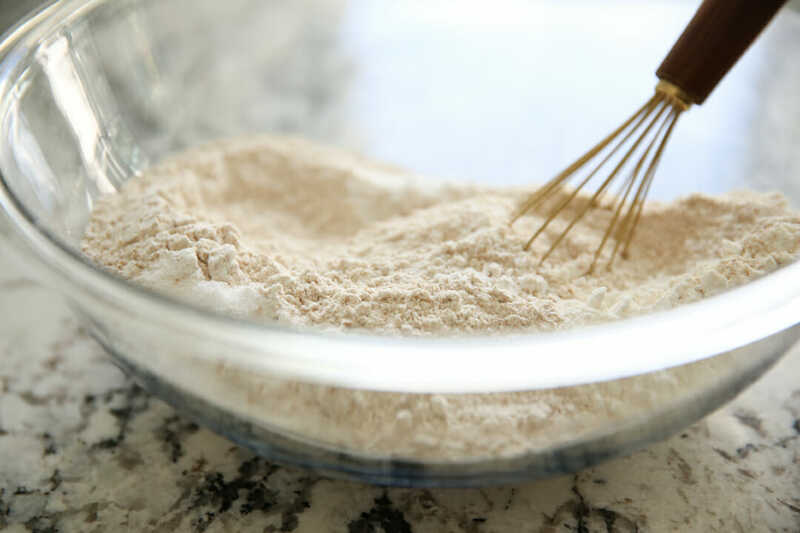 Whisk together the flour, whole wheat flour, salt, baking soda, and 2 teaspoons sugar in a bowl. 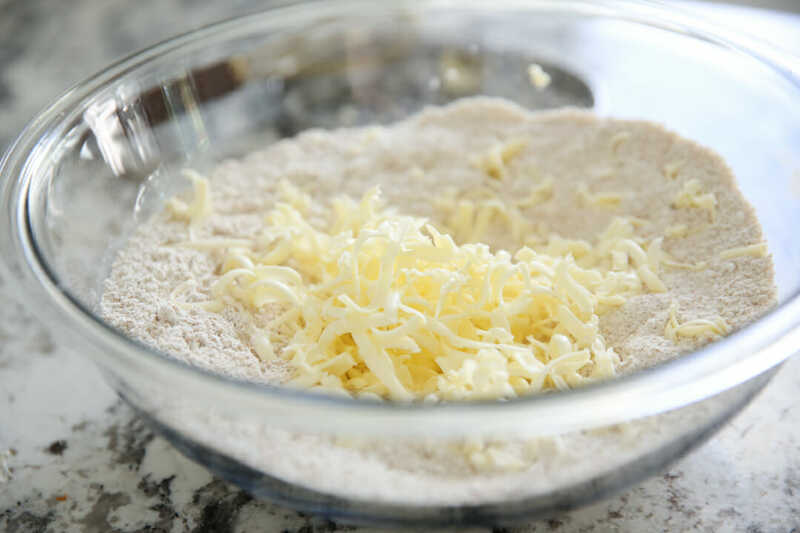 Cut the butter into the flour mixture until pieces are crumb-size. *I suggest grating cold butter with a cheese grater and then crumbling mixture with fingers. Make a well in the center of the mixture and pour in the oil and buttermilk. Stir with a spatula until dry mixture is completely moistened. Freeform Instructions: Move the dough to a generously floured surface. The dough will be quite wet. 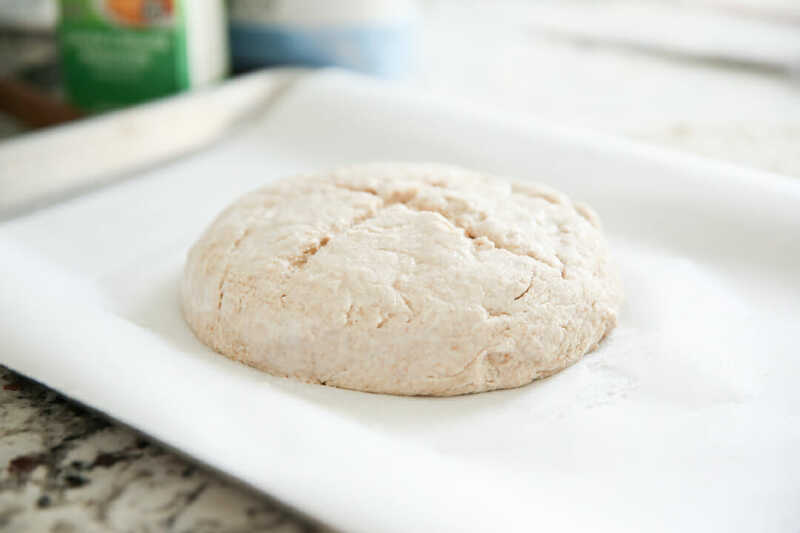 Use flour to avoid sticking and Lightly knead the dough a few times and then form into a round ball. Place on prepared baking sheet. Use a sharp knife to cut a cross into the top of the loaf in an x shape. Brush the top with about 1 tablespoon buttermilk or milk, and sprinkle 1-2 teaspoons sugar over the top. Loaf Instructions: Simply pour dough mixture into loaf pans instead of forming into a shape. Depending on your pan size you may get 2-3 smaller loaves or 1-2 large. Fill pans about 3/4 full. Bake in the preheated oven for 30 minutes. Reduce heat to 375 degrees F, rotate pan and bake another 20-30 minutes or until top is golden brown and skewer comes out clean. Allow loaf to cool on a wire rack for about 15 minutes before slicing. Mmmm… this looks really good! But then again ALL your recipes look/sound great. I had a chuckle reading the text at the beginning, though. When I read "Matthew McConaughey", I thought – Why is he on the list? He doesn't have an accent. haha Paladin, yes he's a Texas boy! So you must be immune to that sweet sound, lol. It's faint too, as opposed to a heavy drawl. I'll take it any way it comes! I'm so trying this. I've always wondered if Irish Soda bread was any good and this convinces me. Plus, it's nice to have a no-yeast bread recipe for those nights when I want homemade bread with dinner but it's already 4:30 and I don't want something sweet (like banana bread). So, thanks! The soda bread looks yummy. I also loved the flat bread from a week or so ago and am looking forward to the gyro recipe! Hi, I love your blog! I'm trying to calculate Weight Watcher points for this bread. Could you give me a rough estimate of how many slices you could get from this loaf? I realize it depends on how thick you cut them but I was just curious before I make it. Thanks! Kim, my loaf was about 9" in diameter so you can calculate it that way by deciding how thick you want your slices and how many you could fit in 9 inches. Hope that helps! a. Can you use all all-purpose flour instead of whole wheat? I'm allergic to whole wheat. Or could I substitute in brown rice flour or something like that? b. Will milk/vinegar or oj (to make sour milk) create the same effect as the buttermilk? I've used that replacement in recipes before, but never in a recipe that was dependent upon the buttermilk for rising. I love that you posted this today! 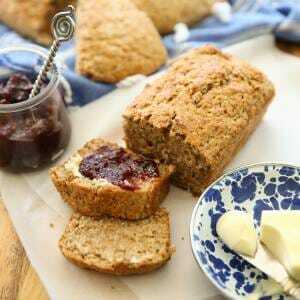 I've been looking for a soda bread recipe that uses whole wheat flour so this is perfect. I just blogged today with a corned beef recipe so I added a little blurb at the bottom linking to this recipe. So I meant to post a comment last time you had a recipe that included buttermilk, but, like all mom's of toddlers, "the best laid plans…"!!! Anyway, my dad the engineer geek and his friends at work discovered something one day while they were probably supposed to be working. Homemade buttermilk!!! Its WAY easy. Buy a carton of buttermilk, use it up except for the last couple of tablespoons, pour it into a pint jar (or whatever size you want) add milk to fill the rest of the way. Let stand at room temp for 24hours, and VOILA! buttermilk! You just keep adding milk when needed and let stand. Its even easier than making yogurt! I love the grating the frozen butter trick. My butter is ALWAYS just out of the freezer. Good tip on the butter. I NEVER thought of that. And the cheese grater looks so familiar…IKEA??? Just put my bread in the oven. This is the first time i've ever made bread. I hope it turns out right. SUCCESS!! YAY…i'm so excited. This bread tastes so yummy too. Kid and Husband approved! Warm from the oven with butter and honey…mmmmm…Happy St. Patrick's Day to me! Just had my second slice of bread! This is a tasty and easy recipe. Thanks for posting it. Made this bread with broccoli cheese soup (it's green, counts for st. patrick's day right?). And it was fantastic! Loved it. Just polished off three slices for lunch with my left over soup. Yeast-o-phobes? Are there people who think of yeast in the same category as like high fructose corn syrup or something? Anyway looks good, I may try this with my corned beef and cabbage. mmmmm…I served a mission in Ireland/northern Ireland and this really does look like the real deal. This bread really is more popular than the regular white version. WOULD LOVE TO SEE MORE AUTHENTIC IRISH RECIPES! Thanks for the post! This looks SO good. I’m glad the whole wheat version is more traditional because I’m a huge sucker for anything whole wheat. It just tastes SO good! I do have a question though, I usually just keep the powdered buttermilk on hand since I don’t like to go out and buy the liquid kind every time I need to use it (like all 3 times per year), but do you know if it would react the same in this recipe causing the leavening affect you’re going for? Can’t wait to try it! And I ditto the request for more authentic Irish recipes. I’ve never really tasted real Irish food other than corned beef and cabbage. Actually, I don’t even know if that’s authentic either! Ha! Stephanie, I think it would work just fine, but I’ve never tried it. If you give it a shot, let us know! You’ll love this bread! I don’t have buttermilk on hand and I always just do the vinegar/milk trick as a substitute. Does this still react with the baking soda?? Made this along with a traditional Irish Stew in honor of St. P yesterday. Easy, Delicious and SOOOO filling. I think I found a new tradition of my own. Can’t wait til next year. If you are interested in trying the Stew let me know. 🙂 Thanks for all your fun recipies! Just had this for dinner tonight, I know I’m a little late sense St Patty’s past but this was really good. Mine came out a little hard on the bottom, but the rest was yummy and crumbly. We had it with butter and honey and it was yummy. Mine also was kinda big, I’m sure I some how made that happen. A side note, I didn’t have butter milk so I did the milk/vinegar trick and it worked great. Give this a try. I’ll “third’ that request for more authentic Irish recipes, since I have lots of Irish running through my blood!!! 2 questions. If I want to bake this bread in a loaf pan, how long should I bake it for? Also, I have read that sometimes people (in Ireland) substitute Guinness for the buttermilk. Have you tried this? How did it come out? For cooking time, I’m guessing the it’s about the same in a loaf pan, but I would set my timer for sooner and check it. I’m sorry I don’t have a more precise answer- I need to make it again to time it. This past batch I made to photograph here was the first time I did it in a loaf pan and I did minis, so I’m not sure! If you try it let me know, haha. I will update as soon as I test a larger batch! As for the Guinness, I’ve never tried that, but I’m guessing that would work. You’ll have to let us know! Is there a way to print this without the big Dove soap ad taking over the instruction part? I’m so sorry- we’re trying to fix that issue! Stay tuned! We like irish soda bread too! This recipe looks good. My husband puts a cinnamon crumble in the dough and it is soo good for breakfast the next morning!